Your Highness, despite starring a more than capable cast with a genius director calling the shots, is an utter disaster, arguably the worst movie I’ve seen so far this year. Which means I’m admitting that a movie starring Justin Bieber is better than one starring Natalie Portman. 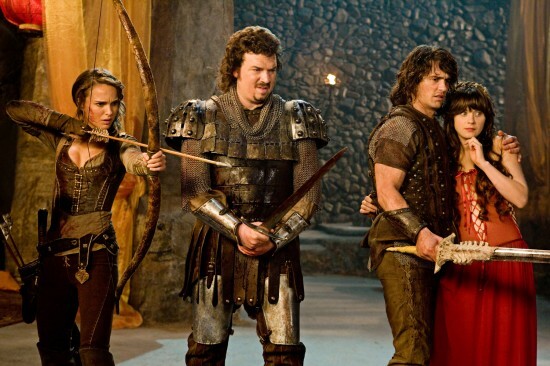 In Your Highness, a straight laced would-be king Fabious (James Franco) recruits his stoned out younger brother Thadeous (Danny McBride) to rescue Fabious’ bride to be (Zooey Deschanel), who is being held captive by a horny sorcerer (Justin Theroux). Along their journey, the brothers run into the bow and arrow yielding Isabel (Natalie Portman) who helps them achieve their quest. You get it. There’s nothing new going on here. Maybe McBride, who co-wrote the idiotic script, and director David Gordon Green were attempting a new riff at the Monty Python formula. Yeah, maybe. Problem is, the Monty Python flicks are, you know, funny. I could sit here and rattle on for paragraph after paragraph about how successfully this film fails on all levels, but, to be perfectly honest, that would be a waste of our time. Instead, let me focus on the film’s most heartbreaking aspect. In 2000, a quiet, sensational film called George Washington (which has nothing to do with the President, but everything to do with human emotion) hit the indie scene like a firestorm. Its director, an awkwardly shaped, introverted 25 year old, was hailed as his generation’s Terrence Mallick. Then something odd happened: in 2003, he did it again, this time with All the Real Girls. The something even stranger happened: in 2004, he did it again, this time with Undertow. Then, just when us loyal followers were sure he had peaked, David Gordon Green released Snow Angels, one of the very best films of 2007 (which, by the way, was a sensational year for American cinema). But I’d venture a guess that most of you haven’t heard of any of those films. Which is why, I assume, Green made Pineapple Express a few years ago. He saw a way to give the stoner comedy a fresh spin, and (finally) make some serious cash. The effort paid off. Pineapple Express, while nowhere near as good as his previous films, grossed nearly triple its budget. I get that, there’s nothing wrong with deviating from your indie street cred to sell out temporarily. But what the hell was Green thinking with Your Highness? I hope pray plead that Your Highness is Green’s career slum, and loyal fans should afford him that. I mean, hell, even Scorsese made New York New York.